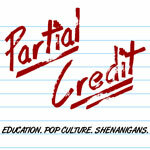 It’s Partial Credit Episode 5! This week we talk about our favorite book-to-movie adaptations. Spoiler alert: The book was better. We also talk Maker Faire, Fortnite, and find out about one man’s quest to do something you wouldn’t believe was possible. And no, it’s not Donnie’s attempt to defect to Ravenclaw. Donnie - kids chasing him around the house taking away points from Slytherin because they think it’s funny. Jesse - Maker Faire (Eepybird.com - Coke & Mentos and Hand of Man) The Hand Of Man is an interactive sculpture like no other. It is comprised of a 26-foot long hydraulically-actuated human hand which is capable of picking up and crushing cars, and a “glove” device that controls it.